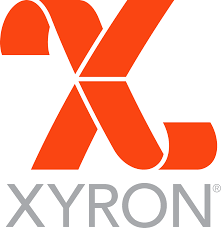 Blog Quick Quotes: Xyron and Quick Quotes Day 4! Xyron and Quick Quotes Day 4! Welcome everyone, today is the fourth day of the partner inspiration and hop between Xyron and Quick Quotes and today we have twice the inspiration with Kathi and Gaby for you to enjoy! Hello and welcome to the Quick Quotes and Xyron cross promotion and blog hop! I have created 2 cards for today using Quick Quotes new collection called "Winter Bliss". 61 days until Christmas Day, and 42 days before I mail my Christmas cards out to friends & family. I started out with a basic white card stock for the card. This card is A2 sized. I cut the blue patterned paper QQP-WI103 to measure 4 X 5 1/4. 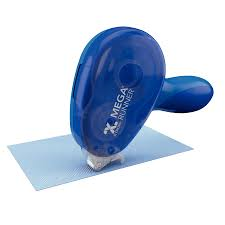 I then ran it through the big shot using a Cuttlebug embossing folder "Snow Flakes". The tree was created with 1/2 strips of paper trimming each of the ends indicated above. The numbers of the paper collection I used are WI105 for the bottom layer working up WI101 then WI104 and the top layer is the back of WI104. I stamped Merry Christmas with Aqua PowderPuff Chalking Ink on white card stock which was layered on WI102. A sentiment was also stamped on the inside of the card. The finishing touch to card 1 was yarn, string, buttons and a pink snowflake to top of the tree. Card 2 base card is also an A2 size on basic white card stock. WI103 measuring 4 X 51/4", placing the blue paper on to the white card stock layering a piece of patterned paper WI104 (white with blue diamond/dot side) measuring 3 3/4 X 5" on top of the blue. A piece of white card stock was placed into the embossing folder "Snow Flakes" then layer it over the patterned paper. I cut out the sleigh and reindeer out of WI103, running both through the Xyron sticker maker, then placed then on to the snowflake back at an angle. Stamp Merry Christmas with Aqua PowderPuff Chalking ink on white card stock which was layered on to a blue patterned paper. Finishing the card by stamping a sentiment in the inside of the card. Cuttlebug Embossing Folder "Snow Flakes"
Thanks for stopping by Quick Quotes blog, check out Gaby's project next. Hi everyone, Gabriela here today with a fun project that you can customize for yourself or as a gift. I'm using the Anchors Aweigh Collection along with some of my favorite Xyron products to make a mobile that you can gift for a baby shower or use as an inspiration for yourself. I'm using some supplies I found in my craft room, so this is a simple project you can do in an afternoon/evening. Gorgeous cards! A darling mobile!Love how easy Xyron makes it! great cards and a precious mobile!!! great job ladies! Beautiful cards and wonderful mobile. Both of these cards are wonderful. They look like they could be easily massed produced, esp. using the great Xyron adhesives. Great for Christmas.